At age 12, my obliviousness was a survival instinct. As my peers experimented with make-up and clothes, I wore a sports bra to school, my hair frizzing into the stratosphere. Most days were spent doing what I loved best -- reading. Inevitably then, my mother one day showed me the six-hour spectacle of Colin Firth and Jennifer Ehle falling in love despite their best efforts. But my first exposure to Jane Austen only left me with more questions: Did people really have hair like that back then? Why so many hats? Is there nothing to do in England except go on walks and eavesdrop? How could a man ask a woman to marry him when they'd never even had a real conversation? But my mother, in her wisdom, simply handed me the book and told me to read it. Despite my initial doubts, I devoured it. Austen's witty, knowing narrator transported me through time and space. Pride and Prejudice allowed me to experience the grown-up tribulations of falling in love and finding yourself, all while engaging in charming banter and fending off the local mean girl with rapier wit. Naturally, for Christmas I received an anthology of Austen's novels -- which I proceeded to lug around school for the next six months. Instead of conjugating Spanish verbs, I travelled to Bath with Catherine Moreland. Instead of learning about the different parts of a cell body, I traded gossip in the Highbury parish with Emma. I would look up from Captain Wentworth's letter to Anne Elliot declaring his undying love to find the boys in my class making fart noises and spitting paper wads into my hair. In short, middle school was a bit of a letdown compared to the world of Jane Austen. So was high school, for that matter. As I descended deeper into my 19th-century refuge, there was never any doubt that I was Lizzy Bennet. Everyone wants to be Lizzy, but I knew I was a true heroine. It seemed fitting then, that a few weeks into my first quarter of college I took a weekend off to attend the Jane Austen Society of North America's conference celebrating the 200th anniversary of P&P. Dressed in an Empire waistline, my hair pinned up, glove-clad hands sweating, I attended my first ball. Everyone who saw the pictures made the obligatory Lizzy looking for her Darcy joke, but to me the conference only cemented my position as everyone's favorite character. But as my freshman year continued, I began to wonder if I'd been mistaken my entire life. Maybe I wasn't a Lizzy, after all. William Deresiewicz -- who, incidentally, is an expert on Austen -- would agree that, along with excellent sheep, top-tier institutions are very good at creating Lizzy Bennets. Nascent cool girls envied by women and desired by men, confident without taking anything too seriously. Someone fun! light and bright and sparkling, in the words of Austen. Throughout my freshmen year, I met many young women who fit this criteria far better than I did. Privileged young women who were universally good at everything, who knew only success. Lizzy faces many setbacks, but never outright failure -- which is something I became familiar with during my freshman year. I returned home to Portland for the summer to do the most decidedly un-heroic work of babysitting, with more questions than ever. Austen never prepared me for talking to my parents about changing my major, trying to translate my passion into a career, boys who are not yet men and more interested in their phones than the five-feet, eight-inches (ten inches if you count my hair) of fabulousness standing right in front of them. But while working on an essay that would eventually fail to gain even an Honorable Mention in the contest I'd previously won, I received the final death knell -- I am the heroine everyone despises. Fanny Price, the protagonist of Mansfield Park, is no one's favorite heroine. From her name to her lukewarm "romance" with her cousin, she always comes in near the bottom when ranking the Austen canon. But as I struggled through re-reading Mansfield Park while working on my doomed essay, I realized we had a great deal in common -- we are both reserved, judgmental, old-fashioned, struggling to compete. Until this moment, I never knew myself. Of course, I still like to think that maybe I am an intriguing mixture of Anne and Fanny, an old soul who improves with age, who learns from her mistake. But for so long, Lizzy Bennet was an integral part of my identity, an influence on what I wanted from life, an assurance that I too would someday find a Colin Firth emerging from the lake. But the great and powerful Jane Austen has spoken, and declared me a Fanny Price. In an essay for the New Yorker, Christopher Beha argues that we shouldn't look to fiction for examples on how to lead our lives. And while I agree with many of the points he makes, on this we differ. We are all socialized with stories, and to a certain degree we all imagine ourselves as on the paths of our own hero's journey. Austen deals not with journeys to the underworld or witches and wizards and elves, but with sisters. Families, communities, gossip, and self-discovery. By simply living my life, I emulate her heroines. Austen may not have given me exact guidance on how to survive college, but she is relevant now more than ever. More than half of Millennials are single? The Regency period suffered a shortage of marriageable young men as they went off to fight Napoleon. The Boomerang generation may be stuck at home, but so was Jane -- and any woman who didn't marry. Even though Austen achieved some moderate success in her own time, she still died while living with her mother and sister, at age 41. Even Austen herself couldn't compete with Lizzy Bennet. Can any of us? I love Lizzy, but only now am I realizing I can't be her. In May, Mansfield Park turned 200, and it will probably take another 200 years for me to resign myself to Fanny Price as my innate heroine. But nonetheless I raise my glass to the Catherines, the Emmas and Elinors, the Mariannes, Annes, Fannys and Lizzys and even Janes that reside in all women. A heroine does not always succeed, and she is not always heroic, but she endures nonetheless. 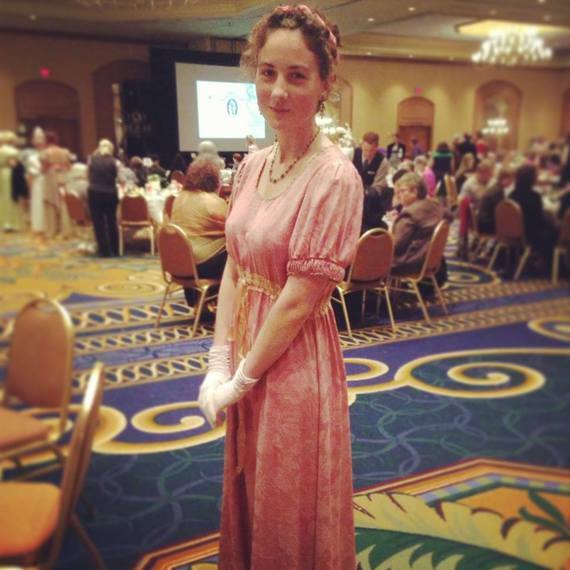 My finest hour at JASNA Annual General Meeting ball in Minneapolis.